World oil prices surged again last week with front-month NYMEX Light, Sweet Crude Oil (“WTI”) futures hitting $101.75 on June 9 2011 for the July 2011 contract. That was up from $98.99 the week before. Oil prices were driven up by worries about the failure of OPEC to agree to higher production targets for the first time in 20 years after US oil stockpiles fell by 4.8 million barrels over the same period according to the US DOE despite a 2.9% fall in US gasoline demand. But OPEC members understand one thing well—high oil prices are good for OPEC members. Rising oil prices today do little to tamp down global demand since that demand is driven not by the United States or Europe but by China. Average oil prices increased by 28.3% in 2010 over 2009 but global oil consumption rose faster in 2010 than any year since 2004 up by 3.1% or more than double the 10-year average increase. Oil demand by China alone rose by more than 10% or 860,000 barrels a day (bbl/d). 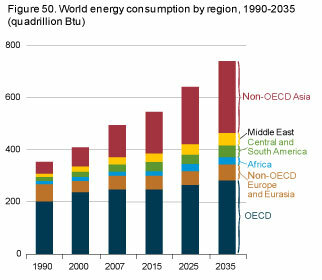 World energy consumption overall is distorted by China’s sustained energy appetite with global consumption growing by 5.6%, the fastest rate since 1973. It is not US economic growth that is driving up oil prices, but we are nonetheless victimized by higher oil and energy prices with little recourse given our dependence upon imported foreign oil. This situation is not changing as energy forecasters expect world consumption of petroleum and other liquids during the third quarter of 2011 to grow 1.3 million bbl/d above second quarter consumption with demand for 2011 averaging 1.7 million bbl/d above the 2010 level. OPEC today accounts for about 40% of the world’s oil production and the OPEC meeting dispute was over whether to increase those production targets beyond the 27.253 million barrels a day set in 2007 to make up for the 1.4 million barrels per day of production from Libya that is sidelined by its civil war. But factoring in the growth in demand from China analysts say OPEC needs to boost output to 29.9 million barrels a day to meet average demand this year or about 1 million barrels a day more than last month based on data compiled by Bloomberg. But by failing to approve a production quota increase OPEC assures that prices will go up and stay high since the global uncertainties over Libya, the rest of the Middle East and other factors. Meanwhile, Saudi Arabia said after the meeting it would increase production on its own and no doubt others will Also “cheat” to take advantage of higher oil prices for their own bank accounts. Meanwhile, the US consumer gets screwed by higher oil prices and thus continued high U.S. gasoline prices pegged to that global oil price. US gasoline demand falling 2.9% last week after the Memorial Day holiday weekend, but the price of regular gasoline fell only one penny per gallon to $3.78 per gallon. That price is $1.06 per gallon more than a year ago at this time. U.S. transportation fuels inventories increased for the fifth consecutive week as demand fell, according to USDOE. America’s energy policy reality in all of this is that the policy is to hinder, frustrate, regulate and oppose expansion of domestic oil and gas production in the US putting America’s energy and economic security at risk. Without a vibrant domestic energy production strategy America is whipsawed by global oil price volatility, subject to price distortions and weakened by the corrosive effects of higher than necessary energy prices on consumer confidence, job creation and economic growth. Worse America’s technology leadership in deepwater drilling is moving offshore to Brazil and elsewhere because they must pay the bills and we won’t let America’s work at home. Recent announcements by Exxon that it discovered substantial new oil deposits in the deepwater Gulf of Mexico put added pressure on the Administration to ease its restrictions on domestic production, but the looming election pits political calculations against the broader public policy interest. 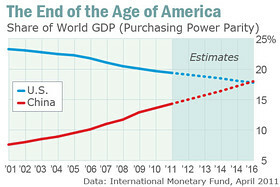 America’s best defense against global energy volatility and the negative effects of China’s rapid growth distorting energy demand and prices is domestic energy production to increase our energy security, reducing the cost of oil imports and its effect on our economy, create jobs and improve consumer confidence. This entry was posted in Competition and tagged China, global energy demand, global oil demand, Middle East, OPEC, Production quota, Saudi Arabia, United States, World energy resources and consumption. Bookmark the permalink.